Raise a glass to Wine Just Off The Vine! Wine Just Off The Vine, one of two signature events hosted by the Mason-Dixon Wine Trail, takes guests on a journey through family-owned wineries stretching across south-central Pennsylvania. 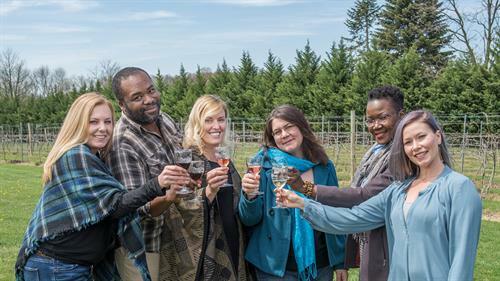 The heart of the Mason-Dixon Wine Trail runs through York County, one of Pennsylvania's top destinations for handcrafted wine. Wine enthusiasts and novices alike will enjoy the personal conversations with wine makers and educational presentations found along the way. Enjoy light food items, a souvenir Mason-Dixon Wine Trail wine glass and a 10% discount on wine bottle purchases. Wine Just The Vine takes place on Saturdays and Sundays, November 10-18, from noon to 5 p.m. Your ticket is good for both weekends and grants you admission to all participating wineries. Designated Driver/Non-alcoholic Wristbands are available for free, and do not include the souvenir wine glass or wine tastings. Pick up your wristband at your first stop. Wine Just Off The Vine takes place Saturdays and Sundays, November 10 through November 18, from 12 noon to 5 p.m.
Tickets are $20 and grant access to all participating wineries over both weekends. Tickets are available here.